Many political progressives have harshly criticized President Obama’s recent trip to Israel and Palestine. They claim he was too warm toward Israel and too lukewarm toward Palestine. Did these critics pay close attention to what the President actually said and saw on this trip? I don’t think so. The president declined to speak to the Israeli Knesset, asking instead for a younger audience. [T]he Palestinian people’s right to self-determination and justice must also be recognized. Put yourself in their shoes — look at the world through their eyes. It is not fair that a Palestinian child cannot grow up in a state of her own, and lives with the presence of a foreign army that controls the movements of her parents every single day. 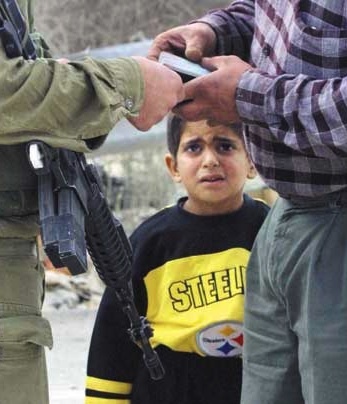 In the picture above one of those Palestinian children watches his father show his papers to an Israeli soldier at a checkpoint. Mayor Baboun, the mother of five, is Bethlehem’s first woman mayor. A former Bethlehem University English literature professor, she was elected in October, 2012. She is also a professor who has a way with words. MJ Rosenberg was one observer of the president’s trip who paid close attention to the fine print that emerged from the trip. In words that must have shaken Netanyahu, Obama referred to “the moral force of nonviolence” to resist the occupation. Coming out of left field, this was probably an indication that Obama read the Sunday New York Times magazine cover story on non-violent resistance in the West Bank by Ben Ehrenreich. Obama compared the Palestinian struggle to the civil rights movement in America, invoking his own daughters as beneficiaries of that struggle. Rosenberg adds that he believes Obama is the first US president to use “the language of justice in discussing Palestinian rights, which is, of course, how Palestinians rightly see it”. The introduction of the “language of justice” into the US public debate over Israel and Palestine, is, of course, long overdue. The encouraging thing is that an American president has used “the language of justice” as a way of warning the Israeli people that their future depends on their leaders’ willingness to embrace that language. The discouraging thing is that the mainstream media covering the trip focused more on power politics than it did on what Obama said and saw in Palestine and Israel. Given the frustration in the international community, Israel must reverse an undertow of isolation. And given the march of technology, the only way to truly protect the Israeli people is through the absence of war. It is instructive to note that a few days after Obama’s trip, the US Supreme Court began their deliberations about two cases, both involving equal rights for gay and lesbian couples. The tide in favor of those rights has shifted dramatically. On his MSNBC program this week, Lawrence O’Donnell noted the “sea change” taking place in this country regarding sexual equality. He reported that North Carolina Democratic Senator Kay Hagan had joined a growing number of political leaders by endorsing marriage rights for gay and lesbian couples. What makes her endorsement particular noteworthy is that the seat she now holds once belonged to arch conservative Republican Senator Jesse Helms. Given the passion and conflict generated by equal rights for gay and lesbian couples, and for Palestinians, why has support for Palestinian justice lagged so far behind support for marriage equality? The answer lies in the power of grassroots support in US political decisions. Whether the previous, more progressive Obama still exists within the man who will take the oath of office on January 20, remains to be seen. But the only way to determine if Obama really is the progressive he claimed as recently as last summer to be is to push not just Obama but the public. Supporters of gay marriage have developed a large grassroots movement which led to these court cases. US supporters of justice for Palestinians, both religious and secular, have yet to build a strong grassroots movement to overcome an unjust occupation. President Obama wants the American public to “make him do” the right thing. His progressive critics should remember that in a democracy, the president cannot change history alone. The video is from Palmedia. 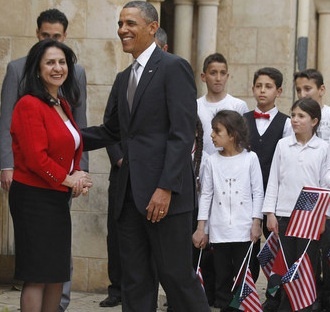 The picture of Mayor Baboun and President Obama was taken in front of the Church of the Nativity by Jason Reed of Reuters. The picture of the child and his father is from the Islamic Forum. * A khamsin is a hot, dry, dusty wind in North Africa and the Arabian Peninsula that blows from the south or southeast in late winter and early spring. This entry was posted in Media, Middle East, Middle East Politics, Netanyahu, Obama. Bookmark the permalink. “Make me do the right thing”, is a cop out on the part of Obama, and demonstrates a lack of moral conscience. I enjoyed the post Jim, although I probably fall somewhere between some critics on the left who largely lambasted the President’s speech and others liek Fareed Zakaria who described it as a watershed moment. My problem with his speech was two-fold: 1) that although the language was powerful and carefully chosen, it’s thrust still depended on the magnanimity of Israelis in giving, allowing, approving Palestinian rights and statehood; and 2) he did not give the same hope, the same support to Palestinians themselves, to the youth who are not party apparatchiks, but who represent the future of resistance. I really appreciate the tone of this post Jim. It is SO EASY to think entrenched forces will continue to rule the day. It is so easy to be negative and judgmental. Obama, for all the verbal (and now proposed military) support, 2017-2027, ugh!, still said all the right things to the Israeli (and Palestinian) public. He challenged them to do the right things in keeping with the best parts of the Muslim and Judaism heritage. Of course it remains to be seen whether the torch will be carried into the upcoming race. Fareed Zachariah struck a similar note in his op-ed in the Post yesterday (“Appealing to Israeli Moral Conscience”). There really is no reason for hope, given the even greater strength of the settler movement in the new Likud governnment. But that is deceiving. Little by little, people are crossing the ethnic and racial divide. They’re sick of the violence and inertia. It’s incremental I think; and unstoppable. And it will grow. The Occupation is not sustainable. Eventually Israel will have to choose between being “Jewish” and “a democracy”. You can’t have both of those together as it has been practiced since 1948 and beyond. No one wants a “Big Bang” although it might take that form, as often happens. Pretty soon it will all be so obvious, people will say, “Why didn’t we do this before?” The extremists on both sides have to be nutralized by positive action and trust-building deeds that show the better way. In a real sense the President is asking the American people to get him (and our Israel First Congress) to “make him (and them) do the right things” just as much as he is asking this of Israeli and Palestinian youth. Of course it isn’t fair to exempt the older generation of making changes. They will be dragged, kicking and screaming, into the new realities. Go to my blog for my last two posts, as a way of accenting your style and substance, Jim, and others. Obama, appealing to our better nature. Of course, we know what happened when that happened 2,000 years ago tomorrow: a judicial lynching. But like our black brothers and sisters explain: “It’s Friday, but Sunday’s comin'”! When there is no hope; people of faith have hope anyway. It’s the nature of things. When seeds get planted, first the blade and then the ear, then the full grain will appear. Herod can’t kill ALL the Bethlehim babies! Israeli forces have sprayed Palestinian homes in the village of Nabi Saleh with “skunk” as a punishment for organising weekly protests against the Apartheid Wall built on occupied West Bank land. Human rights watchdog B’Tselem published a video showing Israel’s armoured tanker trucks fitted with “water cannons” which spray the foul fluid at Palestinian protesters. Let us be sure to note that, aside from sadistic settler-thug violence visited on Palestinians at will with no accountability, this application of “skunk fluid” — a classic, duly recorded example of internationally outlawed collective punishment — is courtesy of OFFICIAL ZIONIST ISRAELI GOVERNMENT action. Has Obama denounced it, or the myriad of similar assaults on the Palestinians, while demanding that JUSTICE be served? No. Obama laid wreaths at the memorial sites for Herzl and Rabin (he of “break their bones” infamy). Did he do so for President Yassir Arafat? No. Obama visited and gushed over Vad Yashem. Did he take notice that Vad Yashem is built on the massacred bodies of hundreds of Palestinians of Deir Yassin residency? No. Obama spoke to Israeli youth (I believe because his intimidation by the US Zionist Lobby would not allow him to muster the moral and political courage to address the Knesset). Did he address a similar gathering of Palestinian youth? No. The hypocrisies, the insults, the Zionist psychotic criminality and US complicity for enabling it, the injustice — all these and more abound in the Holy Land of today and of the past 66 years. Obama, by speechifying to youth, kicked the can down the road rather than taking the buck-stops-here moral course. The prospect: more Palestinians kicked down and on the road for more endless days, years and decades to come. Thanks, Jim, for your words of “Hope”. This is very important. The Zionists and Israeli Right want to snuff out Palestinian “Hope”. This is the only thing that NO Zionist has been able to accomplish, yet: Snuffing out the oxygen from Palestinian Hope, regardless of the tyrannical Israeli occupation. I can see Palestinian youth leading marches, demonstrations, civil disobedience, and protests at the Apartheid Wall. I can see tham carrying posters and banners quoting President Obama and other US Presidents, from Ike to Carter, to Obama, and having social media, and non-traditional media in spreading the word. I also see some elements of Israeli youth and multi-national youth joining them in their efforts. Yes, Jim, you are to be thanked for raisng high the “Banner of Hope” and for calling out that THE GLASS IS ACTUALLY HALF “F-U-L-L”. Your thoughts are similar to mine. I hope we are right and will one day see results. On the other hand I don’t blame some for thinking it is lip service and in the end it may just amount to nothing! Jim: I agree with you that Presidnt Obama gave fine presentations in his recent trip to Israel. He was impressive to emphsize the right of the Palestinian people to self-determination and the justice and power of endorsing the moral force of non-violent resistance. I have waited a long time to hear the President talk about the moral forces of non-resistance. I, for one, was proud of his words and actions. I give him an A-plus for what he said and did in his first visit to Israel as the Presdient of our nation. Harris Fawell, Member of Congress, (retired 1998). Personally I agree that despite some humane retoric, Obama does not emphasize the fact that Israel was founded upon criminal actions. There had been a Balfour declaration that Palestine would be divided, A declaration, but no treaty had been worked out or signed. The Israelis went with guns to an unarmed people and drove them off their land with no compensation, then were rewarded with 3 billion a year by the U,S. government. This criminal action should have been lambasted from the beginning and Obama, or any President (and congress should not have accepted Israel as a close ally and partner.) They were criminal, and cruel, they have treated the Palestinians sadistically for ove 60 years. Their crimes should not be forgotten. They imprison children, put people in jail with no charges, They do not admit to their criminal acts; but they need someone to tell them they must compensate for their criminal actions, not somebody who tells them how wonderful they are. No more money unless they pay for their crimes. Maybe if the Palestinians could see the world through the Israelies eyes then maybe there could be a break through. Maybe if the Palestinians could stop murdering innocent Isralies and stop attacking soft targets then I suppose there could be progress toward a new state. One would think that after fifty years peace concessions that Israel has offered the Palestinians, we (the rest of the world) would realize that the Palestinians ultimate goal is the destruction of Israel. In another words, the Palestinians will receive no peace plan no matter how good it is. It’s an unfortunate phenomenon of timing, Don Bailey, that your post is dated April 2 rather than the intended April Fool’s April 1 that you surely intended. A belated Happy Easter (He is risen, The Prince of Peace!) and April Fool’s Day to you! Obama gave great speeches that may give Palestinians hope. However, Obama’s actions say exactly the reverse! The billions of dollars to support the Israel criminal regime are fully endorsed by Obama. The American public is just waking up to the fact that Obama’s words are worth nothing! Sadly, the Palestinians will again be dissapointed. Good for God in creating a khamsin making President Obama take the low route. Positively Biblical!